I know I just worked with ClassroomFriendlySupplies.com but they had some exciting news to share with my readers! They've just released a new color Precious Pink! This bright beauty is beautiful but there is something even more special! ClassroomFriendlySupplies.com is going to be donating $1 from the sale of each Precious Pink sharpener to Cancer charities. You can see the 2 charities that I have selected here. September is National Childhood Cancer Awareness month which makes this a great month to purchase your sharpener. 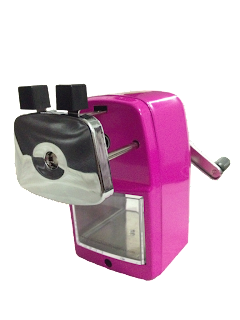 Not only will you get a WONDERFUL sharpener you will be helping out a great cause! ClassroomFriendlySupplies.com is so generous they are going to give one of my lucky readers their own pencil sharpener!!! Just use the widget below to enter!